MetalKrushers is an action-packed game of mobile metal mayhem. 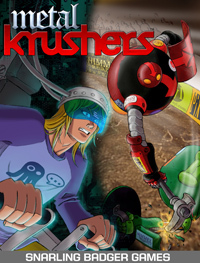 Players construct their Krushers by determining factors such as chassis size, weapons, shields, armor and more. Once built, players maneuver their Krushers into one of the futuristic arenas and the fast-paced melee begins. Krush or be krushed is the name of the game. Take your place at the top of the heap, or become part of it. MetalKrushers is a tactical board game of gladiatorial robot combat for two to six players ages 10 and up. The PDF includes a 14-page rulesbook plus a page of Krusher sheets, a page of Krusher counters, two pages of charts, three pages of arena maps and a deluxe color cover by Claudia Cangini. Players will need two six-sided dice and something to write with. Games can last from 30 minutes to an hour, depending on players.